Can you believe Halloween is a week away?! Seriously, where did October go?! Are you all ready for next Friday? Got all your costumes made/bought? Candy ready to hand out to the cute trick or treaters? Yeah, me neither. Way back in July when we decided to change our family vacation from the end of the month to October I had thought it would be so fun to dress my boys up as Mike and Sulley from Monsters Inc. They both love Monsters University and since we were going to be going to Disneyland for Mickey’s Not So Scary Halloween Party I thought it would be the perfect costume idea! I had it all planned out in my head how I was going to make their costumes and what Jeremy and I were going to be. But, as usual, life happened. And I remembered, I can’t sew. Doh! I really need to learn soon! Anyone want to come teach me?! Jeremy also told me he wasn’t really sold on the idea of being Monsters. So back to the drawing board. One day in September we went to City Creek for lunch and decided to stop in to the Disney Store. Man were my little guys in heaven!! They wanted one of EVERYTHING! Of course we had to get them something, so we settled for a few cars. As we were walking out, Jeremy saw Star Wars costumes and, appparently, it was love at first sight (so to speak). However, I could not and would not justify spending $60 per costume for something they would only wear a few times. Of course, boys gotta stick together and the 3 of them begged and pleaded with me for 2 weeks before I finally gave in. 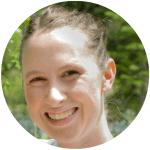 Being the super-frugal gal that I am I started scouring the web for better prices. All the costumes that were less expensive also looked, well less expensive. The Disney ones were really nice quality. So we went back in on a Friday afternoon and luckily they had a sale. And after some negotiating with a super nice girl at the store we walked out only paying $70 for both costumes. Not bad huh?! I still wanted Monsters University to be part of our Halloween this year though. 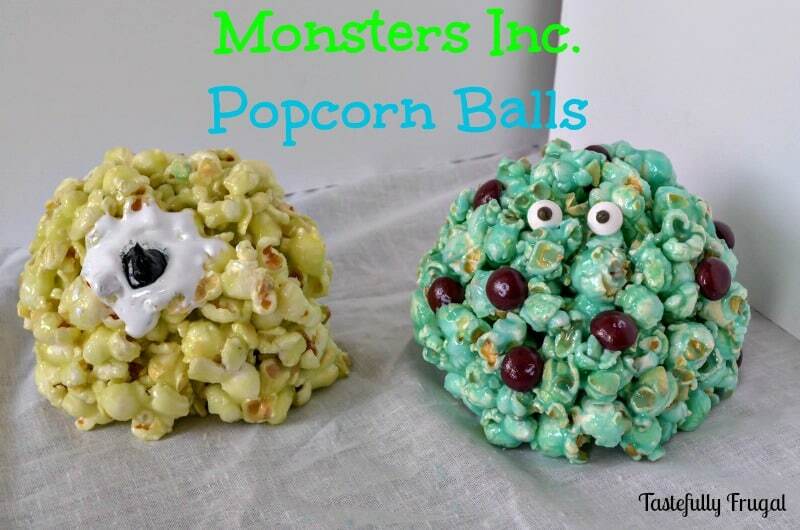 I put my thinking cap on and it came to me one night as I was watching Monsters U with my boys and eating some popcorn… I could make Mike & Sulley Popcorn Balls! I asked the boys if they would like to help me make Mike & Sulley out of popcorn and they were all for it! So the next day we went to Winco and picked up some Jolly Rancher Jello Mix and we were ready to start creating! I love baking with my boys. Not only does it keep them busy, so they stay out of trouble, but the joy I see in their eyes when they get to see the finished project just makes my heart burst with pride. When we were done Rohrl’s exact words were “Oh My Gosh Mama These are SO cute!” Yep, he’s my boy! This is actually a really easy treat to make and super fun to let the kids help with. I’ll share with you in the directions what the boys did and what mom did. Over medium heat, stir together until everything runs smooth (about 3-4 minutes). You don’t have to stir the whole time and I definitely suggest mom do this unless your little ones are older. Pour each gooey mix over popcorn and stir to combine (You should have one green batch and one blue batch). I poured the mix in and the boys stirred. Line 2 cookie sheets with wax paper and pour popcorn out trying to make one even layer. I did this part since the mix was still warm. Bake for 13-15 minutes making sure not to let the colors turn brown. Form about 2 cups (it doesn’t have to be exact, I measured about 4 small handfuls) of popcorn into a ball. 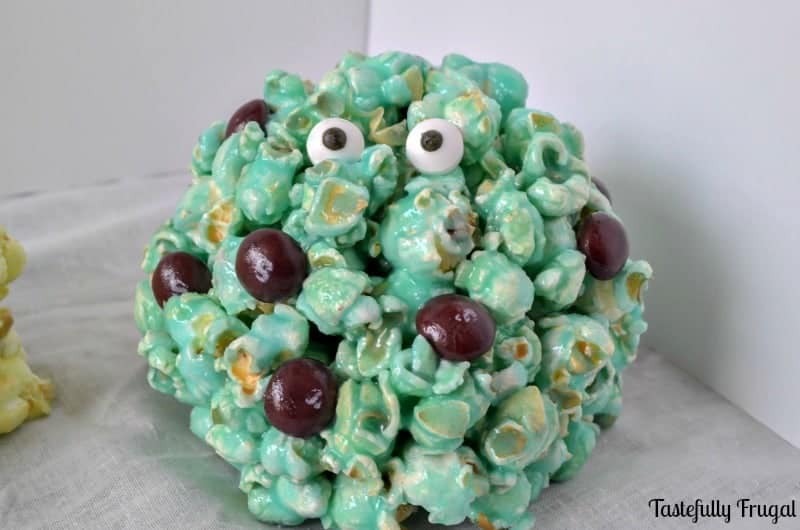 Add the skittles and candy eyes to the blue popcorn to make Sulley. 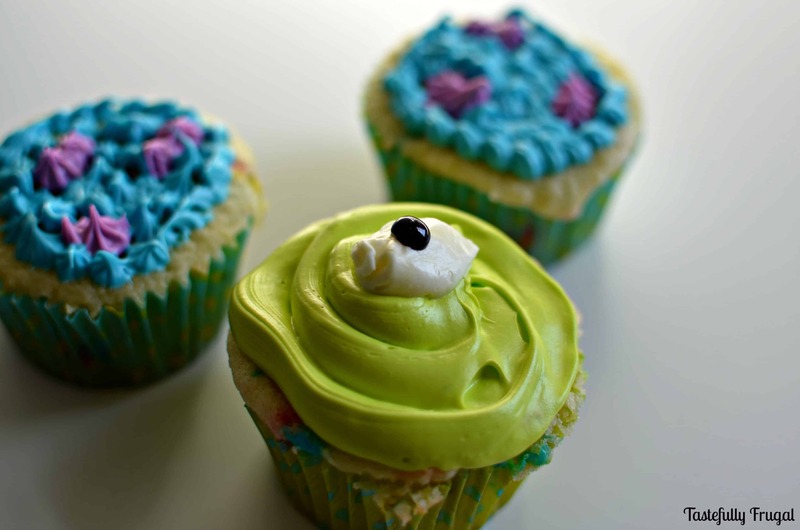 Add a spoonful of Marshmallow Creme and a dot of black frosting to the green popcorn to make Mike Wazowski. **Note: The Marshmallow creme will run so if you want to take pictures of your creations you better do it fast! This made 6 popcorn balls with some extra popcorn leftover. That same night Monsters Inc was on Disney so we got to watch Monsters AND eat monsters! The boys were in heaven! I think this will be a tradition we will have to do every year. Do you have any fun Halloween traditions? Want to meet Mike & Sulley in real life? Head over to Get Away Today and book your vacation package today! Be sure to use code TFRUGAL to save $10! 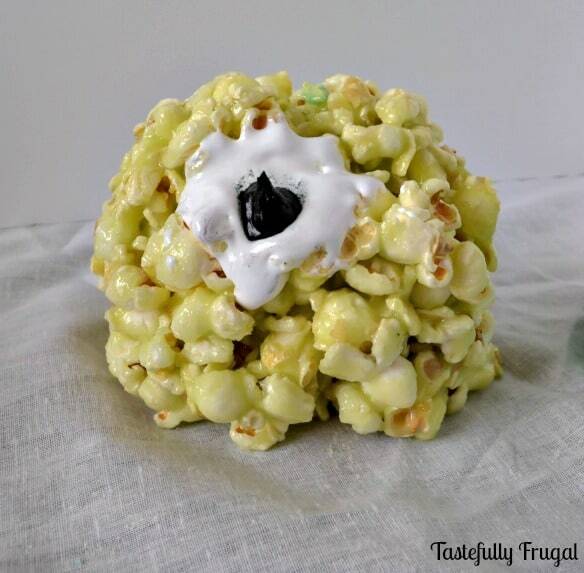 I love these awesome popcorn balls! Seriously too cute. I love the colors you chose, they came out great. Sounds like the whole family had fun making them too, which is always great to get the kiddos in the kitchen to help. Pinning – we will have to try this! Thanks so much Heather! Yes, it was a great family project, definitely something we will be doing again very soon! Nice. I want a bowl of that! Thanks Kathryn! We took the leftovers on our roadtrip and it made a great treat! These are so fun!! And yummy looking, I love popcorn sweet/salty treats! Thank you so much Nicole! Hope you are having a good Monday! What a fun idea! My boys would love this! Thanks Becky! They were one of my boys’ favorite treats too! Fun idea! I love Halloween inspired food! Thanks a bunch Annette! I hope you all enjoy them!! Oh goodness…these are SO cute! Hey! Thanks for linking up at Talented Tuesday! These are awesome! 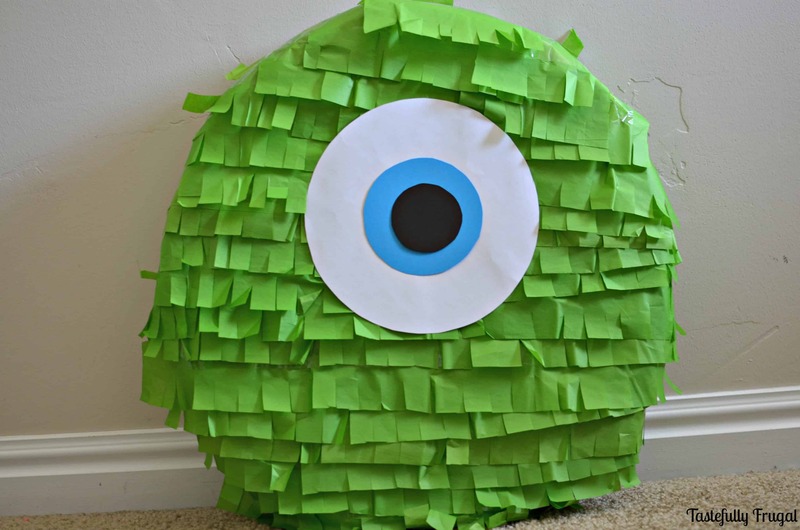 I can imagine any kid who watched Monsters Inc. would absolutely love these! Thanks Natalie! I’m excited for your link party. And these are definitely a big hit with my Monsters loving boys! Oh my heavens these are fantastic!! Pinning and thanks for sharing at Talented Tuesday’s link up party! Thank you so much Meaghan! And congrats on your first link party!! I’m sure your boys are so excited for their Star Wars costumes. My family did a Star Wars theme this year, but we made our costumes. The ones we looked at online weren’t very nice looking, I agree! I even dressed my dachshund up as Chewbacca. Have a good Halloween. How fun Julie!! My baby hated his storm trooper costume but my oldest loved being Darth Vader! I would love to see the costumes you made!! Lou Lou Girls recently posted…DIY Decoration! I’ll be there! Thanks for hosting one of my favorite parties!! So cute! I bet kids love these! 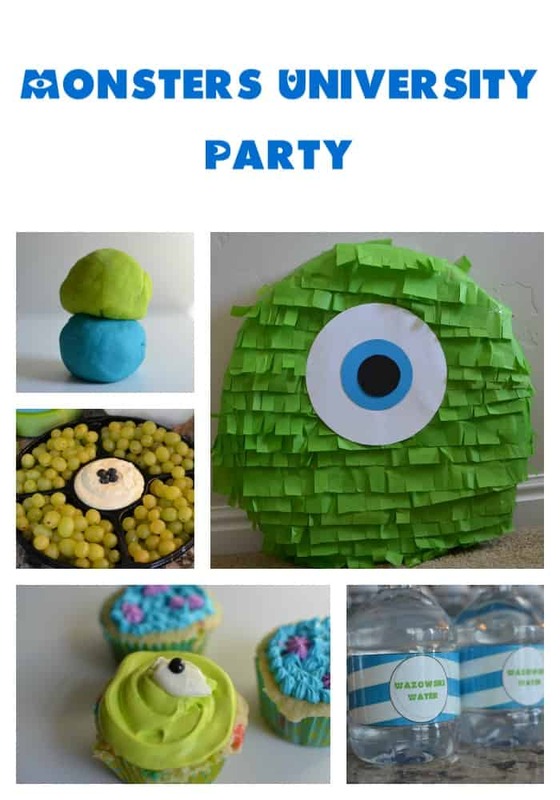 These are so cute Sydney and look like a lot of fun to make:) Thanks so much for linking up to Teach Me Tuesday last week. You are very much appreciated. Starting this week, we will no longer be visiting you, instead we will be pinning each and every link. We want to give you more exposure! Hope to see you again this week!! Thank you Adrian! And thank you for all the social media love! I think that is a great idea! See you tomorrow! Such a cute idea! I love popcorn balls, yum!